“… Now here are some comparative points that you need to know about Faluma…. If you try to sign direct with iTunes your songs will be submitted and it can take several months for them to go thru their submissions for you to get a decision of whether they will carry your product or not. Sometimes they suggest that it may be better for you to go to a 3rd party digital carriers [like CD Baby etc] in order to get your music posted on iTunes. This can take months. With Faluma, who is also a 3rd party carrier and has a contract with iTunes, can have your songs up for sale about a month after you sign and submit your songs! All the rest of carriers such as AOL Music, Yahoo Music etc… will already have your music for sale even before iTunes! You have absolutely nothing to lose by signing with Faluma Digital and so much to gain. GO DIGITAL. 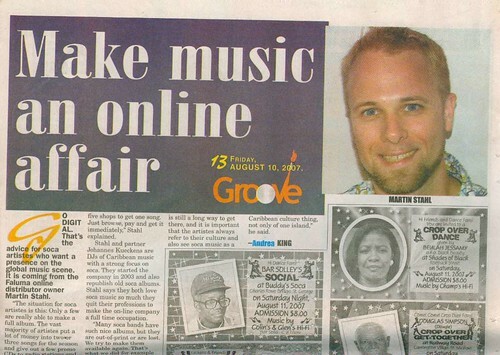 That’s the advice for soca artistes who want a presence on the global music scene. It is coming from the Faluma online distributor owner Martin Stahl. “The situation for soca artistes is this: Only a few are really able to make a full album. The vast majority of artistes put a lot of money into two or three songs for the season and give out a few promo CDs to radio stations and DJs. After Carnival, these songs get lost. “For a few years now, all songs have started to appear on filesharing networks. This might sound bad, because the artiste doesn’t make money off of filesharing; but now all music is available even years after. Artistes get known worldwide. So filesharing networks were the best promotion for soca music. I am pretty sure that the worldwide attention of soca music nowadays has a lot to do with this,” said the german-based Stahl. Faluma acts as both a label and a distribution point. Artistes license the rights to their songs for the digital section, still keeping the rights on their CDs. The online stores gets the digitalised songs plus the cover graphics. “Customers who look for soca just browse in their favorite MP3 store, no matter if it is iTunes, Napster, eMusic or, Finetunes. “Unfortunately, the Cd distribution infrastructure for soca music is not very developed. It is often a big hassle to get the song you are looking for. Now, with soca mp3s the music is available worldwide, easy and quick. No waiting, no shipment costs, no calling five shops to get one song. Just browse, pay and get it immediately,” Stahl explained. Stahl and partner Johannes Kückens are DJs of Caribbean music with a strong focus on soca. They started the company in 2003 and also republish old soca albums. Stahl says they both love soca music so much they quit their professions to make the on-line company a full time occupation. “Many soca bands have such nice albums, but they are out-of -print or are lost. We try to make them available again. That’s what we did for example for Krosfyah and Madd. “Thanks to its many faces, soca can break into more mainstream oriented markets like hiphop, dancehall, or r&b. Even club/house is a good option, as you can see now with the collaboration of Bob Sinclair and Trinidad’s Fireball. But it is still a long way to get there, and it is important that the artistes always refer to their culture and also see soca music as a Caribbean culture thing, not only of one island,” he said. De Cooler says: Lately Faluma.com, online-store and label for Soca & Calypso CDs and vinyl expanded and launched Faluma Digital. This is the new and one of a kind digital label to offer you Caribbean music in MP3, WMA, M4A format in all major music download shops like iTunes, Emusic, Napster, Finetunes, TuneTribe, Musicload etc. […] Lots of rare classics as well as hard to get tunes by up and coming artists are in the pipeline of this unique label. The Official Website of the Government Information Unit Montserrat says: Montserrat’s Soca star Garvin “Scrappy” Johnson has signed a major deal with one of Europe’s biggest music labels. 2007-09: The Bajan radio station CBC 98.1 “The One” aired an extensive interview with Martin from Faluma aka DJ Marflix about Soca in Germany and worldwide and Faluma Digital in their morning program on August 31st 2007 (unfortunatly no podcast available).